We’ve arranged them in order of size so there’s a tree for every situation. You may want to buy one to add to a little nook in your home, or even to rest on a table as a centerpiece. Alternatively, if you only have a small apartment, these are a great way of looking Christmassy without worrying about taking up too much room. 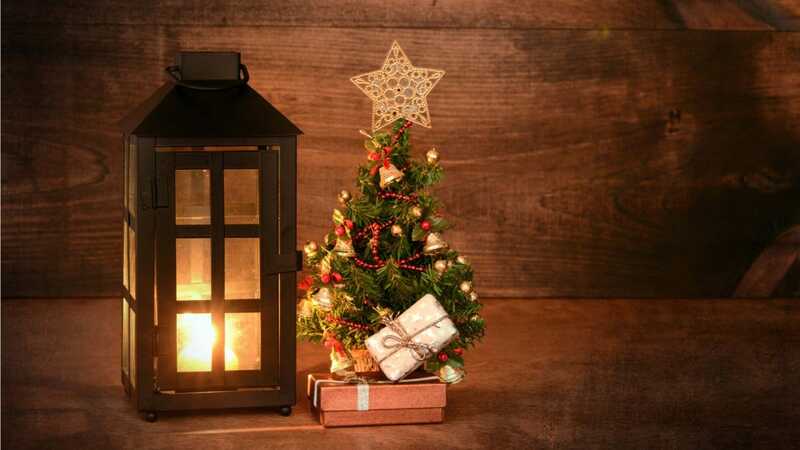 If you’re in need of a conventionally sized Christmas tree, check out our roundup of the best artificial trees. We’ve included some that require you to add your own decorations and lights, while others are ready to use the moment you take them out of the box. Here are some of our favorite mini Christmas trees. 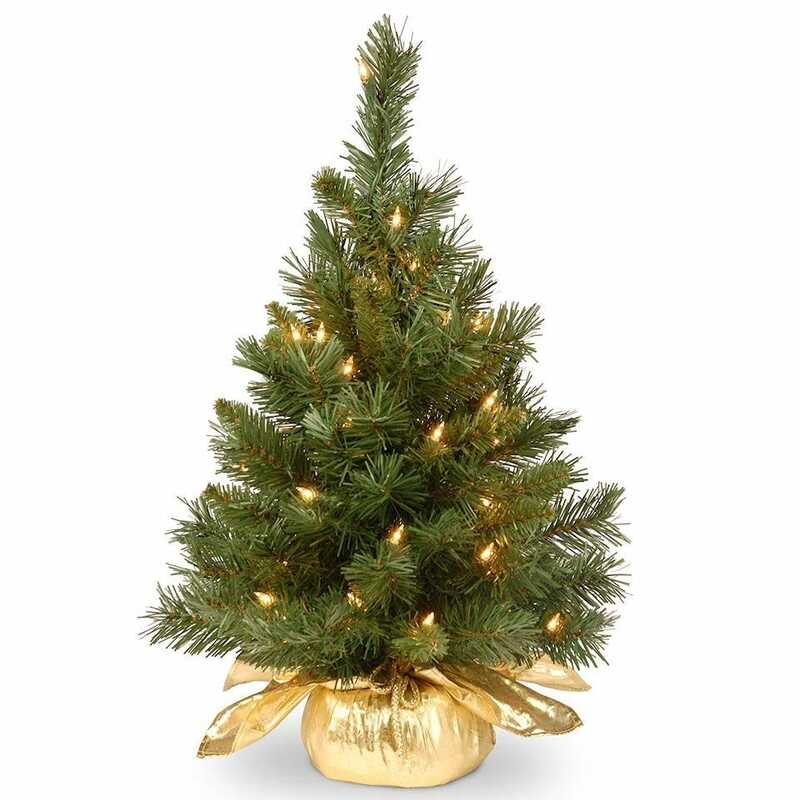 A mere 12″ tall, there’s hardly a location where the Clever Creations 12″ Mini Artificial Christmas Tree can’t fit in and look rather delightful. The tree includes some golden colored ornaments that are made out of shatter-resistant plastic so that they survive year after year. The tree itself is placed inside an attractive looking wicker style pot, so it looks suitably fancy the moment you take it out of the box. There aren’t any lights, but that means you don’t have to worry about keeping it near a power source. Instead, it’s flexible enough to place pretty much anywhere around the home, from your office desk to your coffee table. 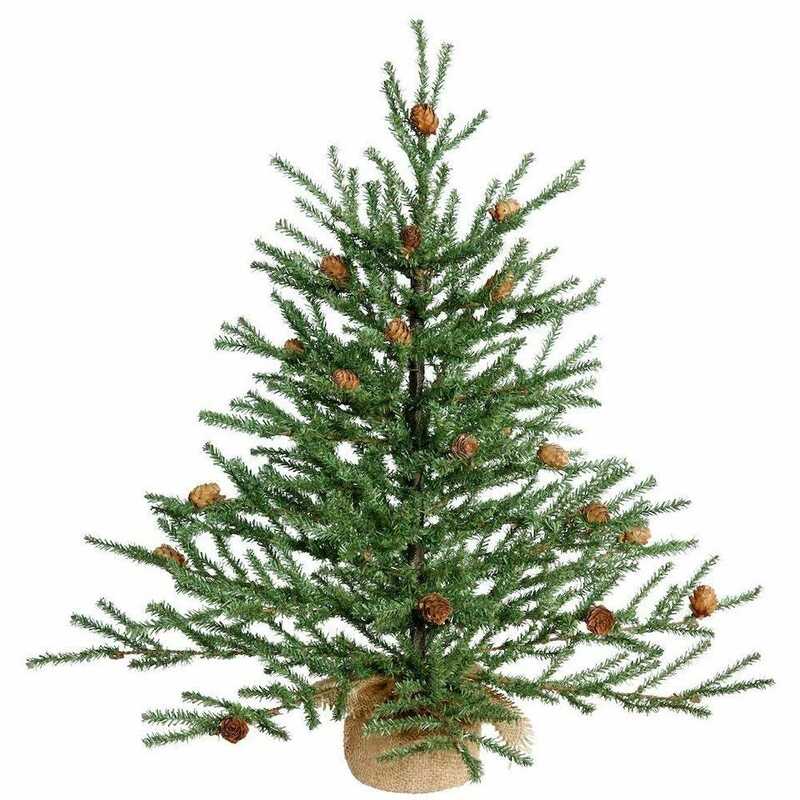 If you’re keen to add the personal touch to your artificial tree, it’s worth considering something like the Darice Pine Tree with Wood Base. It’s only 12 inches high with 60 tips available on the tree. It’s as bare as you would expect a real tree to be on the day you buy it—hence the super low price—so you can do whatever you want with it. A wooden base keeps things looking distinctly rustic. 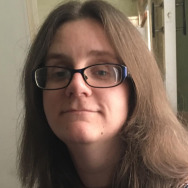 Sure, you need to put the effort in yourself but that’s where the fun comes into it. Don’t expect to be able to fit many decorations on there, given its small size, but it’s nice to have the option. 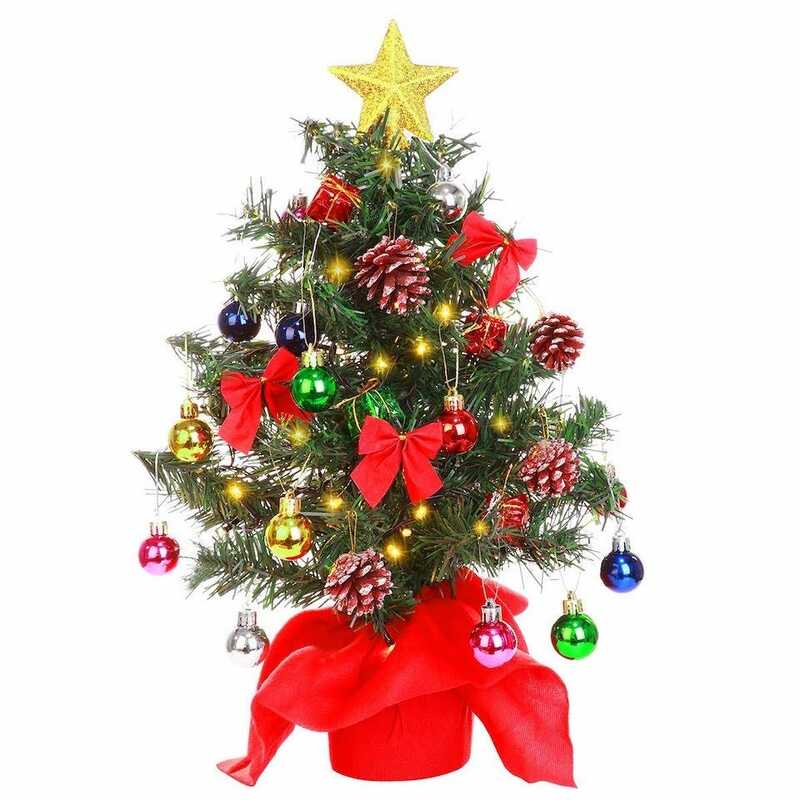 Pretty garish, the Joiedomi 20″ Tabletop Christmas Tree is perfect if you want a vibrant and kitsch tree to decorate your home with. 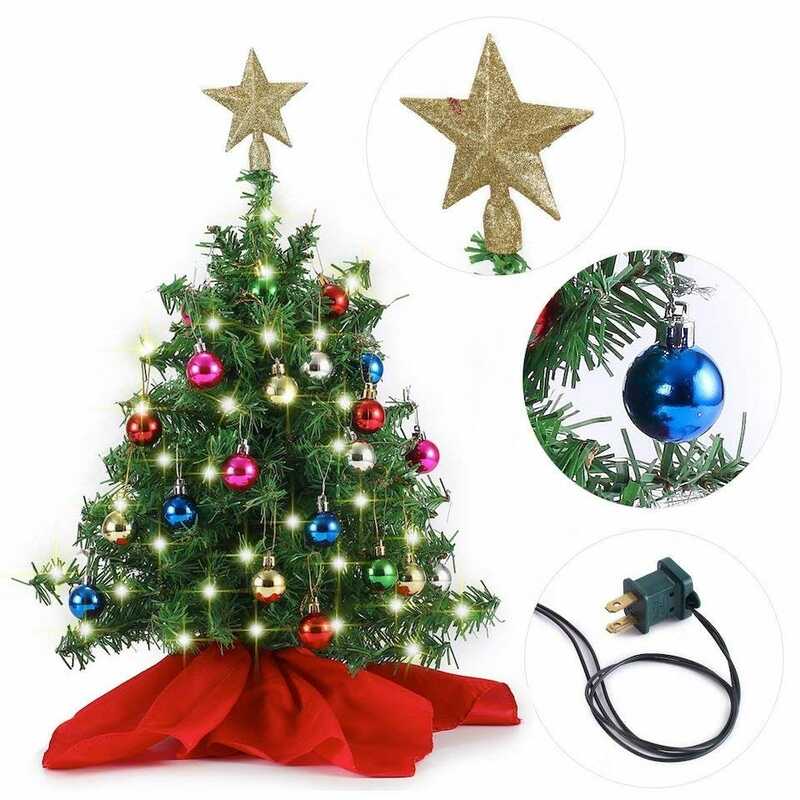 The 20″ tree comes with 50 LED lights on a string, a star treetop ornament, along with 24 mini ornaments that you can hang up anywhere that looks good to you. It’s basically like assembling a regular artificial tree, with you able to add your own personal touch here. Having said that, if you want to take mere minutes to assemble it, that’s still an option. It’s just nice to be able to take your time too, and turn it into more of an event. It’s an ideal middle ground if you don’t have the room for a bigger tree. In a similar vein to the Joiedomi tree, the Yunlights 20″ Tabletop Christmas Tree leaves assembly down to you, but its decorations are far more vivid than before. This time around, you have 24 mixed color ball ornaments, 1 golden star treetop, 5 gift boxes, and 5 pine nut hanging ornaments, as well as 6 meters of lights. It’s pretty impressive how much you can fit onto one small tree. In addition, the lights offer 8 different modes so that you can choose different looks and styles depending on your taste in Christmas decorations. It’s wonderfully varied. Is one tree not enough for you? 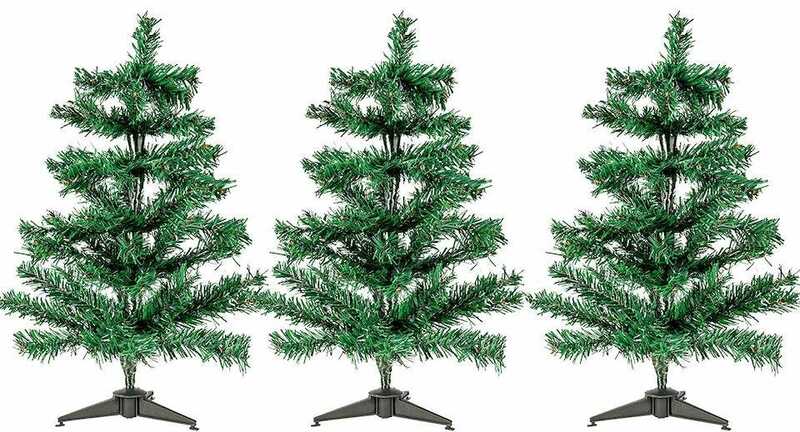 Buy the Juvale 3 pack of 20″ Mini Christmas Trees and you can enjoy a trio of Christmas trees to scatter around your home. Each of them comes with a dismountable 3 legged PVC base so it’s easy to place them on any surface. There aren’t any decorations so it’s down to you to find the right look for your tree. However, that means you can use each tree entirely differently as part of a theme. It’s a great price for so many trees, and ideal if you want to spread Christmas cheer far and wide. 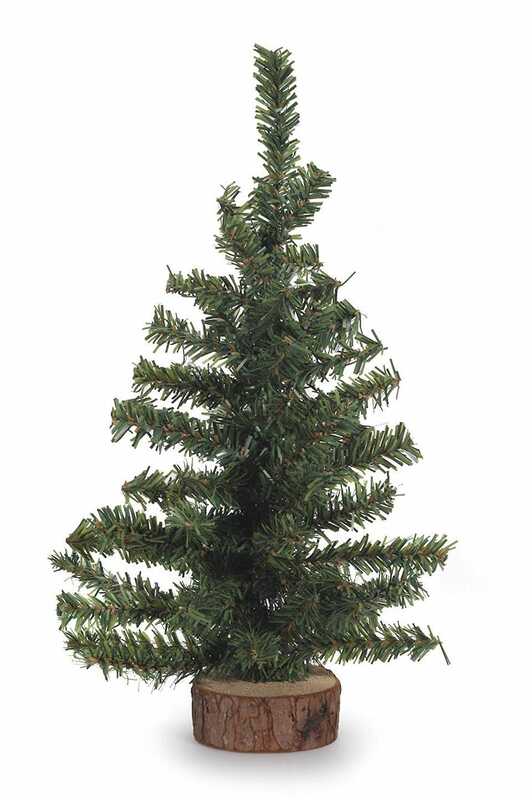 The National Tree Majestic Fir Tree is 24″ tall so it’s more of a mini tree to place in your porch than one to place on top of a table or desk. The tree has an 18″ diameter so it’s suitably full of branches just ripe for placing cute decorations on. The tree is pre-strung with 35 UL listed clear lights but otherwise, it’s up to you what decorations you place on it. 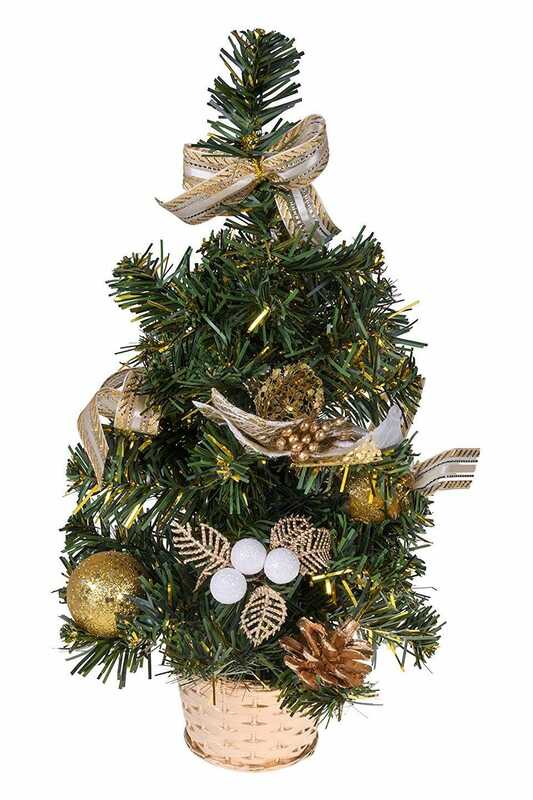 A gold cloth bag base adds a nice parcel style appearance to the bottom of the tree so it retains its classiness from top to bottom. The Vickerman 24″ Carmel Pine Tree is another tree that’s a bit too big for a desk ornament and not quite big enough to be a conventional artificial tree. If you’re low on space or just want something a little extra, this is a useful one. 24 inches high, it has 155 tips made from a mixture of PE and PVC hard needles, so it looks a good mix of realistic and a little bushy too. We’re not saying it’s incredibly bushy, but it has a more natural appearance than most. Its base is made from burlap, continuing the sense of nature that jumps out from this tree. It’s ready to decorate however you want, although some fake pine cones are already attached.